We are fully committed to creating one-of-a-kind, unique entertainment and we are equally driven to guide amazing performers to the next step of their exciting careers. It is inspiring to see the heights of excellence our performers reach. more grooves within live audition. • Rudimental/Marching: Provide 16-32 bars of a rudimental or marching excerpt. along CD or MP3 (only 16-32 bars, showcasing your versatility). • Great personality for entertainment needed – Please tell a joke or a funny story. • Vocals a HUGE plus. • Rhythm guitar strumming in these styles; rock, country/bluegrass, funk, Freddie Green swing. Play 8 bars of each. Play-Along CD or MP3 suggested, but not necessary. • Vocals a HUGE plus. Please include a short example. Current Hits). Please show us 16-32 bars of each. • Please prepare 2 examples of contrasting styles (ex. Pop, Rock, Country, R&B etc.). Please sing 16-32 bars of each. • Ability to accompany your own vocals with guitar or piano is a HUGE plus! • Instrument doubling a plus! Beat-boxing is also a plus. Please demonstrate if possible. • Please prepare 2 short comedic monologues. • Be prepared to improvise on the spot in given stories and scenarios. • Vocals, instruments, or specialty skills (juggling, magic, puppetry, etc) a plus! 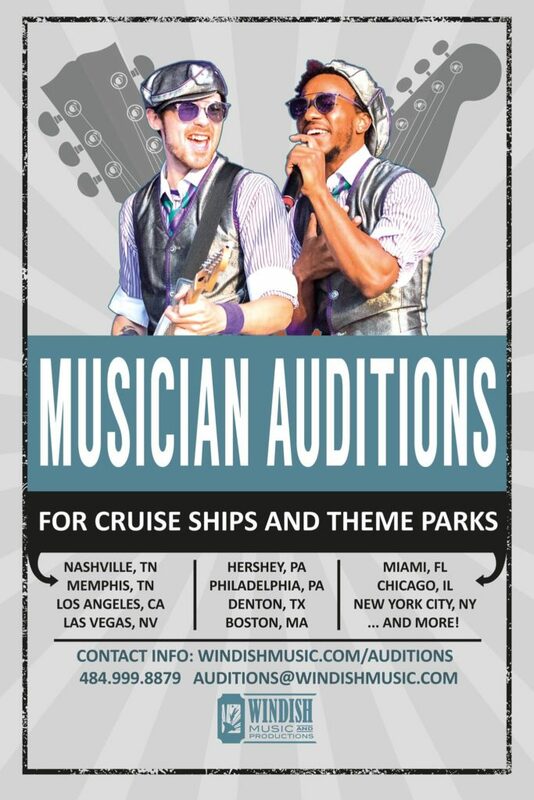 Interested Candidates, please contact auditions@windishmusic.com or 484-999-8879 to apply.